Who would have guessed that you could actually learn life lessons from Polar Bears? That’s exactly what happened to me on my recent trip to Churchill, Canada where I watched the bears in their natural habitat. Absolutely amazing!!! A relentless focus on your goal! 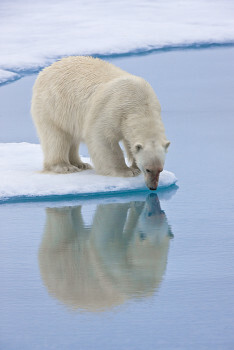 Polar Bears spend each and every day hunting for food, and their main source of food is seals. Without this goal in mind, they will not survive. They are focused and unrelenting every minute of the day as they hunt to stay alive. So how does this relate to you and me? Well, first of all, do you have a specific goal in mind, either personally or professionally? Hopefully, you have one for both phases of your life. Either way, know what you want to accomplish – define it and describe it down to the very last detail. Why do you have this goal? What are you hoping to accomplish? What is the end result? Once you figure it out, focus on that goal each and every day. Pursue your goal relentlessly, like your life depends on it. And if someone tells you it can’t be done, use that as fuel to propel yourself forward. Never give up on your goal – or as I like to call them – dreams. Think of it this way – when you believe in yourself, you have armor no one can crack. Nothing or no one can get in your way. And that is just one of the many lessons I learned from the Polar Bears. Personally, my goal is to become the most dynamic speaker you have ever heard. I can feel it in my bones, I work hard on it every day, and best of all, it warms my heart. I know it is what I am meant to do. So, what is your goal – what is your dream? What gets you out of bed each morning, ready to pursue it relentlessly! Sorry, What’s Your Name Again? My Perfect Facebook Life? HA!!! Nancy on Sorry, What’s Your Name Again? Judy Spriggs on Sorry, What’s Your Name Again? Sharing your gratitude with others can bring so much joy into their life, as well as your own. "Our firm has been fortunate enough to work with Nancy as a speech coach...she is easy to work with, puts them at ease and most importantly provides them with valuable techniques and tools to deliver a great message. I would highly recommend her!" — Sarah Victory, Best-selling Author & President of The Victory Company Inc.
"Your presentation continues to resonate with my team. We truly appreciated the engaging, entertaining and lively activities that allowed us to practically apply concepts of communication and collaboration." "Nancy was able to thoughtfully and effectively create and facilitate a training that exactly met our needs for some of our higher level leadership. More importantly, our participants found great value. Here are a couple of quotes:"
"I was very inspired to become a better communicator"
"I learned a few tricks that I feel will help me be a better leader." "I have had the opportunity to work with Nancy in a range of venues. She has provided me incredible inspiration and practical strategies to take action and move forward with confidence to reach my goals. She is super creative and a true pleasure to work with." "Thank you to Nancy for her wonderful keynote speech she gave to Reach Dane employees, a non-profit organization in Madison, WI that serves children and families in need through educational and supportive services. The leadership team for Reach Dane was extremely impressed with the amount of preparation and attention to detail Nancy gave in planning for her keynote presentation. She did an excellent job inspiring and promoting wellness and self-care to our hard-working staff!" Book Nancy now for her Unshakable Success™ presentation.